FIND OUT HOW letterpress things work. 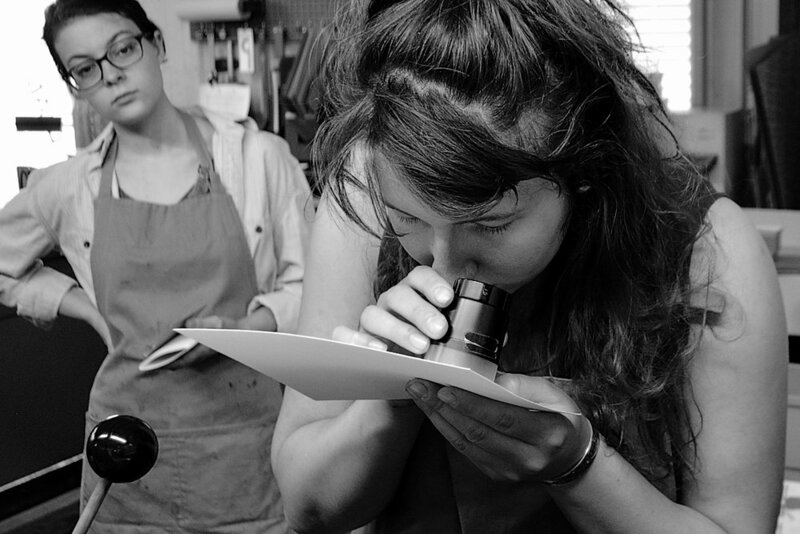 If your printmaking interest runs deeper or you're thinking of starting your own business or studio, take a technical workshop to get started on the right foot. And if it's been a while, brush up on your skills here and learn to work a little smarter. You'll learn the printing basics common to all presses, the advantages and limitations of various types of presses, troubleshooting, papers & inks, plate options, maintenance and more. Whichever press you choose, it's always hands-on, and each of these workshops grants you the opportunity to rent that equipment for your projects. Click here for rental details. Click here for the workshop calendar or contact us to request a date for your group. PRACTICE THE BASICS of hand setting wood and metal type before locking it in position and readying it to print on our table top presses. Click here for details on Letterpress 101. Covers shop safety, traditional type composition, printing prep, press maintenance, clean-up, and resources. Click here for the workshop calendar. BECAUSE THESE CYLINDER PRESSES are relatively easy to use, they are in demand by designers and printmakers. You'll also appreciate their capacity for deep impression and accurate registration. These are the workhorse presses at Lead Graffiti where we've produced almost all of our portfolio work. Click here for details on Vandercook workshop. While paper for both presses is hand fed, the SP15 is hand cranked and the Universal III is a push-button automatic with 3 modes of operation. You'll work with both in this workshop as you learn shop safety, printing tips, press adjustments, plate options, soft vs. hard packing for the right impression, maintenance, and resources. Click here for the workshop calendar. NO PERSONAL PROJECT? No problem. Maintain your recently acquired Vandercook skills while you seek or create projects of your own. This opportunity is available ONLY to those who have completed the technical Vandercook technical letterpress workshop listed above. Click here for details on Afternoon Diversions. You will work with Lead Graffiti staff on a broadside of their choosing, hand setting type, locking up the form, adjusting the press, printing, etc. Click here to request a date or here for the workshop calendar. THIS POPULAR FLOOR-MODEL PLATEN PRESS is the go-to workhorse for large and small letterpress shops. You'll appreciate that you can quickly print, score, die cut and perforate, all in the space of 20 square feet. Click here for details on Floor-Model Platens. Not for the faint of heart, this press requires total concentration from you during use. Your hands-on experience covers shop safety, printing tips, troubleshooting, maintenance, and resources. Click here for the workshop calendar. THINK BIG and historic when using these 2 giants: the smaller 1928 Albion is 21" x 29" and the 1869 Washington Hoe No. 5 is 25" x 38". Click here for details on Iron Hand Presses. Made of cast iron instead of wood like Ben Franklin's "common press", these hand-pulled presses are relatively simple to operate for straightforward jobs printed on dampened papers. Get your hands on both Lead Graffiti presses as you cover shop safety, press adjustments, paper handling, inking, resources and more. This is truly old school. It is surprising how many kids love printing on these during our H.N. Werkman workshop. Click here for the workshop calendar.